If you and/or your spouse are planning on playing 12 rounds or more at the Refuge this year, this is your best value! Rounds expire 1 year from date of purchase. 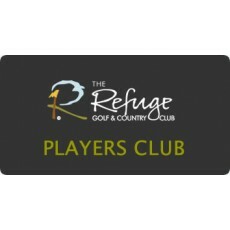 You can purchase a Players Club Package with your credit card below. You may pick it up in the Pro Shop at your convenience. When you order this product online, you will receive a email which will act as your voucher to redeem at the club.